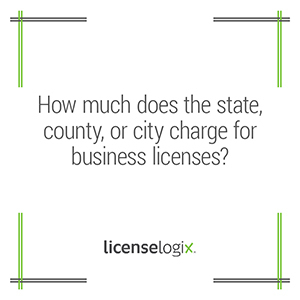 Business license costs vary from state to state, county to county, and city to city. Different municipalities use different methods to determine how much you will have to pay for your business license (sometimes called Business Registration, Business Tax Certificate, Occupational License, Privilege License, et. al.). Typically, you will be charged a one-time application fee and a periodical renewal fee in order to maintain a legal business in a given jurisdiction. It is not uncommon to owe business license fees to the city, county, and state in which your business is located.